After planting, perennial crops need a few years to establish strong roots before producing significant yields. Our crops are now producing strong harvests and we are excited to share them with you! With a variety of berries, nuts, culinary herbs, and tree fruits, our farm's crops are ideally suited to small-scale producers like restaurants, apothecaries, and cocktail bars. To inquire about availability, request a sample, or place an order, please contact elle@lilyspringsfarm.com or call (317) 698-0787. This Russian cultivar (Chernaya Lisavenko) is loved for its authentic flavor. It is a small, glossy berry, rich in Vitamin C. The berries are suitable for all purposes, but are favorites in sauces, salads, jams, cordials and syrups. Our raspberries produce fruit from mid-summer into fall and pair well with our other berry options. Prelude is an early-ripening variety that typically has a smaller yield in fall, while Joan J, a thornless variety, produces in fall. A native plant to North America, the elderberry flower (Ranch, Johns, Bob Gordon, and Wyldewood varieties) is a limited seasonal product. It makes excellent elderflower simple syrups, herb infused sodas, cocktails, and wines. The four cultivars on the farm (Ranch, Johns, Bob Gordon, and Wyldewood) are native to North America and produce a tart micro-sized berry. This vitamin-filled berry, is perfect for elixirs, tonics, shrubs, syrups, ice cream and sauces. Throughout the season, we offer a variety of limited culinary herbs, including: sage, thyme, bergamot, lemon balm, chamomile, and yarrow. Herbs are available fresh or dried and come in various sizes and bundles. Aronia has a thick skin and sour flavor, a high tannin content and is rich in antioxidants and anthocyanins. It freezes well, and is popular in smoothies, sauces, jams and drinks. Our Viking variety is firm & flavorful. Dried elderflower can be used for much of the same products as fresh-cut flowers, and is an excellent addition to cordials, teas, and salves. Flowers are dried on racks over the course of a week, then de-stemmed and packaged. Whether to commemorate your visit to the farm or to support us from afar, consider purchasing a Lily Springs steel pint or hammock! To inquire about colors or place an order, please contact elle@lilyspringsfarm.com. 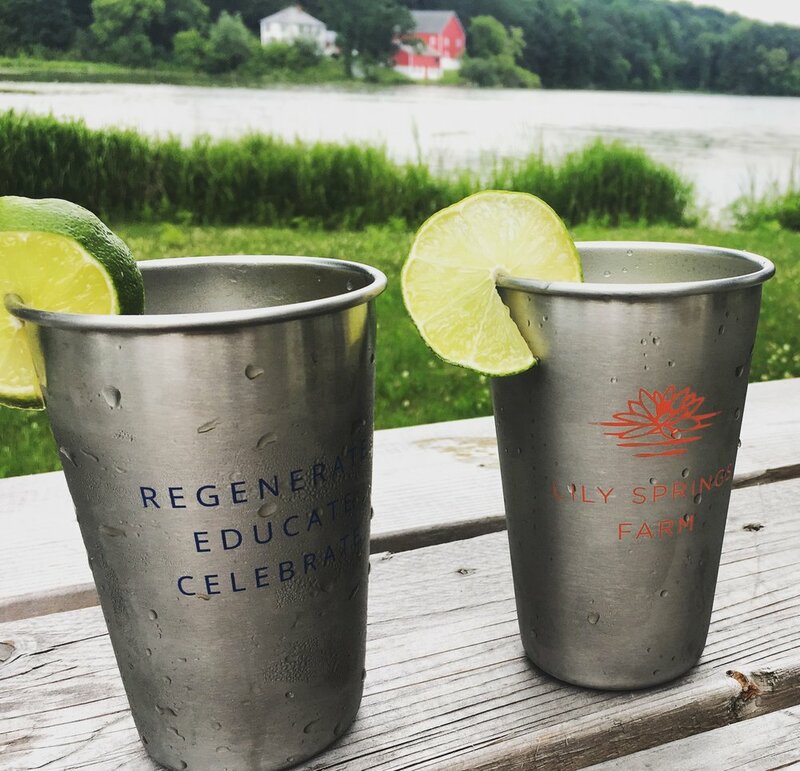 With the Lily Springs Farm logo on one side and our motto on the other, these reusable pint glasses are refreshing and responsible. They're lightweight and durable, perfect for happy hour outdoors. Four colors available: blue, orange, green, and brown. Gin & Tonic not included. Ideal for relaxing after a hard day of farm work or hanging out in the backyard, the LSF-branded hammock comes with a suspension set-up and can be stored in the attached side pouch. Available in three combinations: grey and orange, red and navy, and black and turquoise.